On the eve of the first presidential debate between President Obama and Governor Romney, we were treated to new survey data from eight states. And it was a pretty good day for the president with comfortable leads confirmed in several deep blue states, a slight edge in the one Romney toss up state (North Carolina) and a closer than expected Romney lead in Missouri. That we get new data out of Florida on a daily basis makes more sense than the rather high frequency of survey work coming out of reliably blue Massachusetts, but the two states do have one thing in common. The individual polling results aggregated are more often than not confirming/calibrating rather than of the sort that fundamentally changes the outlook of the race. The difference is that there is and has been a tight race in Florida all along and a clear Obama advantage in Massachusetts. The new Suffolk poll of the Sunshine state fits that bill. At Obama +3, it is right in line with the range of polling results to have emerged from the state. FHQ is glad to have the data, but this is merely a confirming polling result. Nothing to see here folks. With or without the new poll from the Baltimore Sun, Maryland is in the Obama column. We cannot keep coming back to the post-Akin noise argument about Missouri polling. That said, the polling has varied there, but has calmed down since the congressman made his "shut that down" comments in August. Though the polling has been relatively light in the Show Me state, the Romney lead there is in the 3-7 point range with the two of the last three polls indicating something closer to the low end of that range. The FHQ weighted averaging formula currently has the state at the top end of that range, firmly within the Lean Romney category. My first thought in seeing the Obama +11 result from We Ask America out of the Silver state was that it reminded me of the last minute surge toward Obama in the state in polling and on election day. In the 2012 context, however, that margin feels a little high compared to other recent surveys there, and on top of that, the 2008 shift occurred later in the race than where we are now. October polls can be a bit noisy and this one seemingly settles nicely into that area: noise. Another day and another low double digit polling margin in the Land of Enchantment. This time the new information is from Rasmussen. New Mexico, close in 2000 and 2004, just has not materialized as a toss up (or even lean) state in 2012. In that way, it has been more like 2008 than either of those previous elections. It has swung back to the GOP some, but not nearly enough to bring the state into a more competitive light. Any (October) day that has a poll showing Obama ahead in North Carolina is -- zero-sum -- a win from the Obama perspective and a loss on the Romney side. 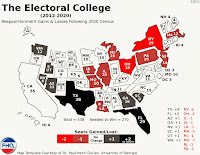 That isn't to say that the president will win the 15 North Carolina electoral votes. In fact, Romney has consistently held the advantage in the FHQ averages. Instead, the importance of North Carolina is figuring into the strategic calculus of the race. Romney resources expended there are resources that are not being spent in states that Romney has to turn red over the last handful of weeks of the campaign. See Maryland, but with the caveat that this is the first survey conducted in Rhode Island gauging respondents' opinions on the presidential horse race. The resulting data, however, does little to alter the thinking here at FHQ regarding the state of the race in the Ocean state. 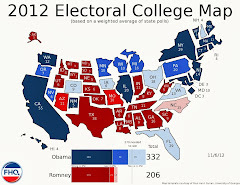 It is blue and is way out on the Obama end of the Electoral College Spectrum. ...still. Further south in Virginia, Roanoke College has posted a poll finding Obama up eight. The key here in the "why +8" is that while Obama's share of support in the survey is consistent with other recent polling in the Old Dominion (not to mention the FHQ weighted average level of support), the Romney share of response is well below his established weighted average level of support. Five points lower. For context, no poll has shown Romney below 40% in Virginia since -- and this was the only other time -- Marist/NBC found the governor 17 points behind the president in early March. The eight point margin from Roanoke is perhaps a bit high compared to other recent polling in the state. ...and it is almost completely a function of Romney's position in it. Methodological changes and resultant map/spectrum shifts aside, the same picture of the race that existed last week seems to be reiterated this week as the race heads into debate season. 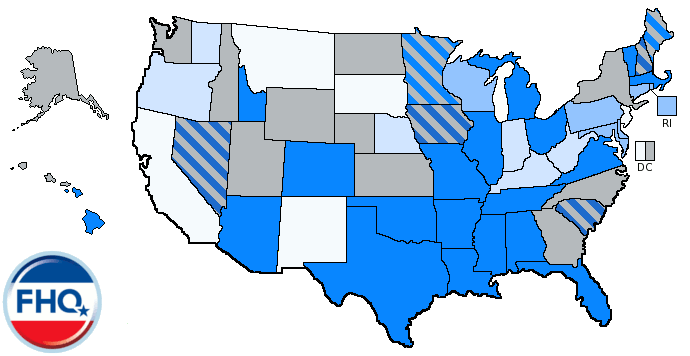 There were some minor changes at the margins of the three FHQ categories of states when the cutpoints were lowered, but the same story continues to be told. Obama has the lead in all of the toss up states save North Carolina. Those are not insurmountable advantages, but they have been consistent. And that must be the most troubling thing to Romney campaign. Heading into the debates, Romney should gain simply by being on the same stage with the president, but that may not necessarily be the type of, sigh, "game change" the governor will need to alter the course of the race. 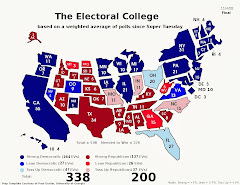 Needless to say, the map remains unchanged today and the only shift on the Electoral College Spectrum involves Maryland and Massachusetts changing positions for the second consecutive day. The remaining seven states in which new information was introduced held the line relative to a day ago. The same is true for the Watch List with one exception. New Hampshire rounded up to a 5 point margin yesterday and was still technically eligible for the list. Today, however, the gap was just a shade above 5 points and the Granite state goes off the list as soon as it came back on. On the list or not, New Hampshire is still among that quartet of states (Michigan, Nevada and Wisconsin are the others.) that Romney would like to bring into play rather than fighting it out in a constrained group of toss ups where there is little or no margin for error.